​General information regarding burials and the history of Prospect Hill Cemetery, as well as the history of Omaha and the surrounding area, may be found at the downtown W. Dale Clark Library (Omaha Public Library), at the Douglas County Historical Society Library at Fort Omaha, and at the Nebraska State Historical Society in Lincoln. Pictures of most of the stones at Prospect Hill can be viewed on Steve & Marta's graveyard website (which also has information on other local cemeteries), NebraskaGravestones.org (below), and Find a Grave(below). 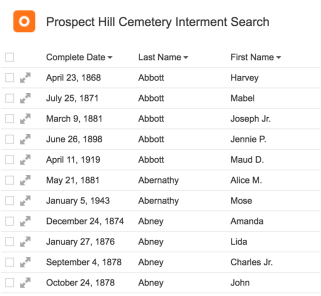 For a searchable version of all interments, click here. When you click on the link to go to the searchable database of the interments, a window that looks like the image on the left will pop up. From here you can scroll through the simplified view of the interments. To search, go to Edit - Find, or click [Command] and [F]. This will bring up an interactive search window, the second image on the left, where you can click on individual records. When you click on one of these records, an individualized entry will pop up, shown in the bottom left image. This version of the interments only includes the name and date of the interred.